It’s Fall! Time once again for the round of fall rides in Texas. Last weekend was first one of the season for me and Kem. 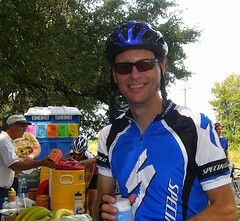 The Hill Country Challenge ride was last weekend in Burnet. Finally getting around to some notes on it. We chose to do the 64 miler. I’ve ridden out in that area before, but as it turned out, a fair bit of the 64 mile route (actually 65 by my count) was on roads I’d never done before. Nice change of pace. And I really liked the route. Way off the beaten path and for a good part of it at the start, practically zero traffic. Some places I’m likely to return to ride again. You put up with a lot of cattle guards, rough roads and low water crossings in these remote areas though. Not a big deal, but you really have to be careful. In this case, many of the cattle guards had a gap right up the middle. Don’t see that too often. Very easy for the wheel of even a mountain bike to get snagged in there. Even though someone had gone out in advance and spray painted such obstacles orange, someone took a header on one of the cattle guards. Apparently she was ok, but the helmet she was wearing is no more. I don’t know for sure, but might have been a case of some folks in a pace line. I don’t really think these kind of rides/roads are all that suited to the pace line crowd but you always find them anyway. The problem is, a rider in back doesn’t see that the cattle guard has a gaping crack right down the center – even if someone shouts it out. They chose the weekend of the Austin City Limits music festival to do the ride, so I’m not sure they got the turnout they were expecting. Still though, there was a decent number of people that attended considering that for most folks participating means driving an hour or more out to Burnet. The food after was good. Salad, pasta and some chicken. And for a change, I actually liked the t-shirt they were giving out. Overall, great ride. 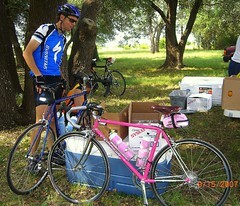 The pink bike in the second picture is undoubtedly Kem’s wonderful Tommasini.